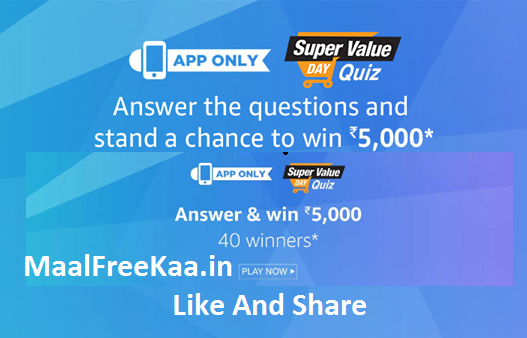 The Super Value Day Quiz Contest Live On Amazon Apps. Amazon Super Value Day is live now and this is the best time to shop for groceries and household supplies as you get products at great discounts + up to Rs 1200 cashback. Not only this, there would also be crazy deals. Amazon Super Value Day Quiz. Amazon is also conducting a small quiz MaalFreeKaa.in No. 1 Website in News Media About All Online e-Commerce News Update. You Grab Daily Awesome Freebie Product or Prize When you Play our Publish Online Giveaway and Free Sample Claim. Now We Leading Page in IPL 2018 Contest You Can Play IPL Contest and Get Free Official IPL Team Jerseys, T-Shirt IPL Match Tickets, Top 5 IPL Player Ranking And Much More. Only One Platform Given you chance to win every time freebie prize if you answer all the quiz questions correctly, you will be entitled for a lucky draw which will be carried out amongst participants who have answered that particular question correctly. The draw of lots will be carried out during the Contest Period for the questions and a total of 6 participants will be selected as winners by a random draw of lots. A total of 40 participants will be selected as winners of the Contest. Play Now To Win Free Amazon Pay Balance. Quiz 1 : Shopping on Super Value Day gives you cashback on purchase of household supplies and more. What is the maximum cashback you can avail? Quiz 2 : Super Value Day cashback offers now run for first 3 days of every month instead of 2 days earlier. Quiz 3 : Which of the following would NOT be eligible for the Super Value Day cashback offer? Quiz 4 : Customers using which bank’s credit or debit card are eligible for the additional cashback on shopping from Super Value Days? Quiz 5 : After the order is dispatched, how long does it take for the Super Value Day cashback to be credited to customer’s account? 2. 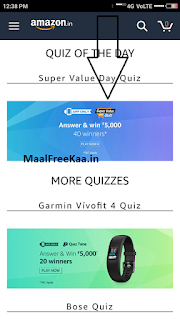 Open Amazon And Click On Home Banner "Amazon Super Value Day Quiz"